In this lesson, we will learn how to measure time in hours, minutes, and seconds by using addition and subtraction. 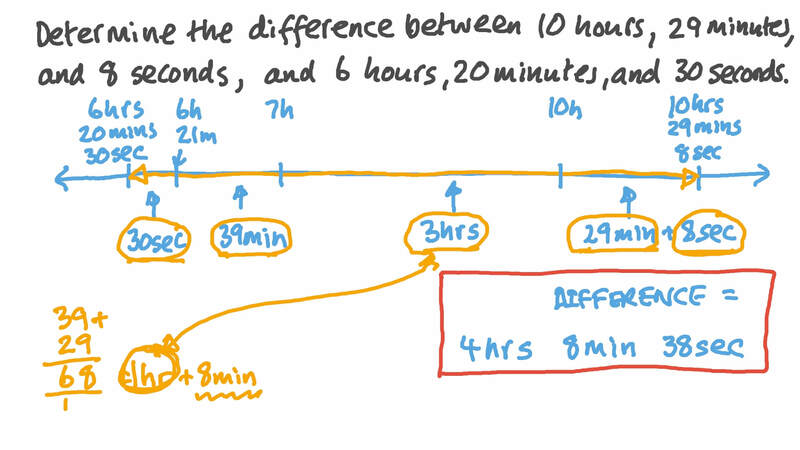 Determine the difference between 10 hours, 29 minutes, and 8 seconds and 6 hours, 20 minutes, and 30 seconds. The given table shows the time Adel spends on his morning activities. Estimate the total time it takes Adel to get ready and arrive at work. Express, in hours, minutes, and seconds, the finishing time of a marathon winner who completed the race in 8 569 seconds. Add 11 hours and 34 minutes to 3 hours and 43 minutes. Add 7 hours, 45 minutes, and 15 seconds to 2 hours, 10 minutes, and 33 seconds. Fill in the missing value: There are seconds in 2 3 days. How many minutes are there in 76 and a half hours? How many seconds are there in 3 hours, 34 minutes, and 10 seconds? Fill in the missing value: 1 1 4 hours + 25 minutes = seconds. Fill in the missing value: 1 2 + 1 3 + 1 4 = h o u r h o u r h o u r minutes. Fill in the missing value: 59 hours + 3 0 0 minutes = days. Fill in the missing value: 190 minutes and 300 seconds is the same as hours. Fill in the missing value: 3 3 4 days + 2 4 0 minutes = hours. Fill in the missing value: 1 1 4 + 8 = o f a d a y h o u r s m i n u t e s .
A student read a novel for 1 3 of an hour, a science book for one hour, and a newspaper for 1 4 of an hour. How many minutes did the student read for? How many minutes is 11 hours and 43 minutes? How many hours is 49 days and 2 hours? The table lists the final rankings in the women’s giant slalom races in the 2006 Winter Olympics. The times are recorded to the nearest hundredth of a second. Which two countries' times have the greatest difference? Sally went into a car park 3:25 pm and parked the car at 3:37 pm. Find the time it took for her to find an empty parking spot. Maged started doing his maths homework at 11:09 pm and spent 58 minutes working on it. At what time did he finish? Amir wakes up at 6:12 am and he has 70 minutes to get ready to leave for school. At what time does he leave home? The number line shows the time when Adam called his friend on a mobile phone and when the call ended. Find the duration of the call. The number line shows the time that Maged started playing a game of dominoes. He spent 33 minutes playing. Which of these shows one way to find the time he finished playing? What time did he finish playing? The number line shows the time that Shady finished working on his car. He was working on it for 43 minutes. Which of these shows one way to find the time he started? What time did he start working on his car? Adam put a meatloaf in the oven at 11:18 am. Given that it needed to bake for 2 hours and 58 minutes, at what time should he take it out of the oven?